Low TSH levels (thyroid-stimulating hormone) usually mean that your thyroid is producing too much T3 and T4 thyroid hormone. Because an overactive thyroid secretes too much thyroid hormones, signals are sent to your pituitary gland to secrete lower TSH levels. This can cause symptoms of low TSH or hyperthyroidism such as weight loss, nervousness, difficulty sleeping, or light periods (in women). Hyperthyroidism isn’t just connected to low TSH levels. For doctors to diagnose and treat conditions related to an overactive thyroid, they also check levels of T3 and T4 in your blood. The causes of low TSH can be Graves’ disease, nodules that stimulate the thyroid, or inflammation. 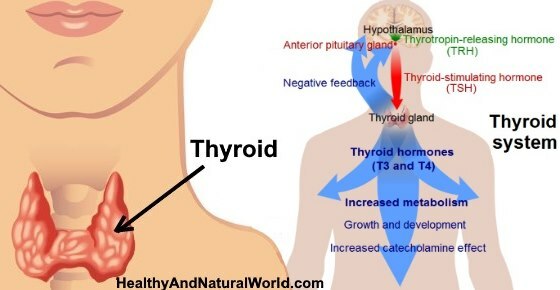 In this article, you will learn how low levels of TSH affect the thyroid hormones triiodothyronine (T3) and thyroxine (T4). I will also look at what should be the normal levels of TSH, T3, and T4 and how you can spot symptoms of hyperthyroidism. Your thyroid is a gland in the front of the neck that secretes important hormones in the body. This small, butterfly-shaped organ produces hormones that control metabolism and growth in the body. Your pituitary gland in your brain produces a hormone called thyroid-stimulating hormone, or TSH for short. For example, blood tests for TSH levels are used to routinely screen newborns for thyroid issues, monitor thyroid replacement therapy, or help diagnose infertility problems. What is T4 and free T4 (FT4)? Levels of free T4 (FT4) refer to the amount of thyroxine that is biologically active and not bound to protein. Doctors usually test for FT4 levels to help identify possible causes of thyroid issues. Free T4 is the active form of thyroxine. What is T3 and free T3 (FT3)? As with FT4, free T3 (FT3) is the active level of thyroid hormone that can be used by the body. That is why low TSH levels indicate an overactive thyroid gland or hyperthyroidism. This is because many doctors say that individuals with TSH readings between 2.5 mIU/L and 4.0 mIU/L are at risk of developing thyroid disorders. What are Low TSH Levels? The normal reference range for TSH blood tests is between 0.4 and 4.0 mIU/L. Therefore, if your blood test readings for TSH show up lower than 0.4, you have low TSH levels. Doctors will then run further tests to check free T4 and possible free T3 in blood serum. If your TSH levels are low it could mean that you have hyperthyroidism because your thyroid is probably producing excess amounts of T3 and T4 hormones. Some other disorders that are not thyroid related can show low TSH and also low or normal FT3 and FT4. Let’s look in more detail at reasons for showing signs of hyperthyroidism. Graves’ disease is the most common cause of hyperthyroidism where you have low TSH and elevated T4 and or T3. Plummer’s disease is a condition where multiple nodules become overactive in the thyroid gland, causing it to secrete more thyroid hormones than it should. Other types of growths in the thyroid can also stimulate the release of more than normal thyroid hormone levels, thus cause TSH levels to drop significantly. Proper levels of iodine are essential for the health of the thyroid gland. If you have too much iodine in your diet, your TSH levels could drop and you may start showing sign of an overactive thyroid gland. The journal Nature Reviews Endocrinology reports that iodine is naturally found in kelp, bread, milk, some vitamin supplements, and salt fortified with iodine. The recommended amount of iodine needed per day for proper thyroid function is 150 μg. In cases of underactive thyroid, doctors may recommend a diet rich in foods containing iodine for hypothyroidism. If your TSH levels are low, it could mean that you have a condition called thyroiditis. Inflammation of the thyroid can cause your thyroid to swell and start secreting more T4 and T3 than it should. This increase of thyroid hormone results in depleted TSH levels. Thyroiditis can result in either hyperthyroidism or hypothyroidism depending on how the inflammation affects the thyroid. Tumors in the ovaries or testes affect your hormones and can suppress TSH levels. When this happens you will show signs of hyperthyroidism. Non-cancerous growth in the thyroid gland or pituitary gland can mean that you have low thyroid-stimulating hormone in your body. On rare occasions, growths in the thyroid can become cancerous and the thyroid needs to be removed to prevent the cancer spreading. What Are the Effects of Low TSH Levels? What does it mean if blood tests show low TSH level but the free T4 levels are normal? Another reason for low TSH levels and normal free T4 is if you are undergoing T4 treatment for hypothyroidism. Why can you have low TSH levels but normal T3 and T4? In cases where blood tests show that you have low levels of both thyroid-stimulating hormone and thyroxine, the cause is usually not connected with your thyroid. LabsTestsOnline. Free T3 and Total T3. Medscape. Toxic nodular goiter clinical presentation. Nat Rev Endocrinol. 2014 Mar; 10(3): 136–142. Medscape. Struma ovarii clinical presentation. Medscape. Testicular cancer clinical presentation. CancerOrg. What is thyroid cancer? NCBI. Screening and treatment of subclinical hypothyroidism or hyperthyroidism. Br Med Bullet. 2013 Sept;107(1): 101-116.